9/28/12 FYSF, Win (2) Miosolo One Size AIO Cloth Diapers! New Feed Your Stash Friday! Enter to win two Miosolo AIO Cloth Diapers from Diaper Junction! These are really easy to use, perfect for daycares, babysitters and definitely daddy or grandparent friendly diapers. Enter to win two of your very own. Time to announce the lucky winner of last week's FYSF Giveaway! We gave you all a chance to win the Diaper Rite Covers and Diaper Rite Birdseye Flats, an economical and easy to use cloth diapering system. FuzziBunz Diaper features YOU will love! have you tried the FuzziBunz line of diapers yet? Curious about their features and what makes them different from other cloth diaper brands? Read all about FuzziBunz Diaper features in this blog post! Cloth Diaper News: Fuzzi Bunz on Shark Tank! What do sharks and cloth diapers have in common? They'll both be on television Sept 28th! Read today's blog post for details on this exciting news! Will you be tuning in? We sure will! 9/21/12 FYSF, Win (12) Flats and (2) Diaper Rite Diaper Covers! Have you been dying to try birdseye flats and diaper covers? Well then this week is for you! This week's FYSF we're giving you a chance to win a dozen flats and two Diaper Rite OS Diaper Covers! Winner of our Feed Your Stash Friday! Did you get a chance to enter throughout last week? Well now you can check to see if you were the lucky winner! Flip Diapers: Small Price, Big Benefits! Considering cloth diapers? 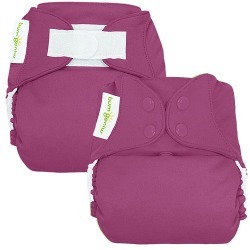 Start by trying the immensely popular and affordable Flip Diapers System of diapering. The Real Diaper Association needs your help! Participate in the 2012 Great Cloth Diaper Survey. The 2012 Great Cloth Diaper Survey is for cloth diapering families only, plus there's an incentive for participating. Take the survey today! 9/14/12 FYSF, Win (2) Econobum Diaper Trial Packs! Ready for our next Feed Your Stash Friday Giveaway? You can enter to win (2) Econobum Diaper Trial Packs! Win this giveaway and you'll take home two Econobum One Size Covers and six Econobum One Size Prefolds. Winner winner winner time! Don't you just love hearing who the winner is each week? We sure do love announcing it! Winner of our Gro Via Sampler FYSF Giveaway has been chosen! Read on below to see if you're the winner. If you want to find the best cloth diapers for your baby, then you probably want to know a little about different brands of cloth diapers and how well they work. Here is some information about where to find cloth diaper reviews and how to use them to help you make your decision about what cloth diapers to buy for your baby. Best Cloth Diapers for families on a budget! Looking for the best cloth diapers for cloth diapering on a budget? Well then you've come to the right place! Read this informative post about the various cloth diapers offered by Diaper Junction, that not only are affordable, but they work just as good as some the the most popular more expensive brands. 09/07/2012 FYSF, Win a Gro Via One Size Cloth Diaper Sampler! Ready to feed your stash? We hope so! A person can NEVER have too many cloth diapers! This week we're giving you a chance to win a Gro Via One Size Diaper Sampler! Ready to see who won last weeks FYSF Giveaway? Freetime Diapers by BumGenius, leading the way in innovation and keeping cloth diapers easy to use, absorbent and convenient. What makes the Freetime Diapers so special? Read today's post and find out!